It's all about ... ME. Hilarious comedy rules in Disney's Emperor's New Groove! There's something for everyone in this hip, funny movie with its dynamo cast, distinctive style, and great music - featuring the Academy Award-nominated song, "My Funny Friend And Me" (2000, Best Original Song). Emperor Kuzco (voiced by David Spade) is turned into a llama by his devious advisor, Yzma (Eartha Kitt), and her hunky henchman, Kronk (Patrick Warburton). Now the ruler who once had it all must form an unlikely alliance with a pleasant peasant named Pacha (John Goodman). Together, they must overcome their differences as they embark on a hilarious, "groovy" adventure. Discovering the good in everyone has never been this much fun! Your whole family will enjoy this comic delight again and again. $9.812 million on 2801 screens. If we examine the box office performance of Disney’s two animated films from 2000, we see a study in contrasts. First up was May’s Dinosaur, and it brought in a lot of cash. After an opening weekend gross of $38 million, it went on to nab $137 million in the US. That’s not an unbelievable take, but it’s a solid payday. On the other hand, when The Emperor’s New Groove hit screens in December, it was greeted by a sad $9 million opening weekend, and it ultimately grabbed $88 million when its run was done. That’s almost 50 percent less than the gross of Dinosaur, so why does Groove feel like the bigger hit of the two? Expectations, baby! Disney prepped Dinosaur as one of the big flicks of the summer, and though it obviously took in quite a lot of money, it dropped rapidly after that initial opening weekend. The film enjoyed little positive buzz as the general consensus felt it was visually stunning but fairly lackluster and formulaic. A different mindset greeted Groove. Apparently Disney didn’t see it as their holiday hit, as they spent most of their time and money hyping November’s live-action 102 Dalmatians. Bad move: 102 D pretty much stiffed at the box office; its gross of only $67 million was fairly pathetic considering the studio’s expectations. Groove crept into theaters with little fanfare, and when one viewed that lousy opening weekend take of $9 million, it looked like the movie would slink out of town quickly. However, Groove enjoyed excellent word of mouth, and its revenues steadily increased as time passed. While the final gross of $88 million meant that Groove took in less money than any Disney animated film since 1990’s The Rescuers Down Under, the numbers don’t tell the whole story. Groove overcame a lack of publicity and weak opening figures to do reasonably well. As such, I consider the film to qualify as a hit. It probably doesn’t hurt that I really liked the movie. I’m fond of most of Disney’s 1990s/2000s animated flicks, and I have difficulty rating them. Nonetheless, Groove definitely stands among the cream of the crop from the last decade. Groove tells the story of Emperor Kuzco (voiced by David Spade), a spoiled brat who rules his land via his impulsive whims. This means that he tramples over the desires of folks like Pacha (John Goodman), a kind peasant whose village Kuzco will trample to build “Kuzco-topia”, his new vacation resort. Yzma (Eartha Kitt) assists Kuzco; she's a sorceress Kuzco fires due to her repeated attempts to usurp his power. With the help of her hunky but dense aide Kronk (Patrick Warburton), Yzma tries to poison Kuzco but instead turns him into a llama. When Kronk fails to be ruthless enough to follow Yzma’s commands and kill Kuzco, the llamafied emperor ends up in the back of Pacha’s cart and accompanies him to the peasant’s village. From there we go through a somewhat standard buddy tale in which the two guys are initially at odds - mainly due to Kuzco’s selfishness - but they eventually learn to work together so they can both succeed. Actually, that description puts too much blame on Pacha; he’s always willing to do the right thing. Kuzco has to take the steps to learn trust and friendship before he can return to defeat Yzma and regain his old human form. Based on that plot synopsis, Groove doesn’t sound to be much different than many other Disney flicks. Selfish character learns to be more giving and ultimately becomes happier; it’s the usual fluffy fare we’ve seen time and again. However, though the message may be familiar, the execution sure isn’t, as Groove provides a much wilder and wackier affair than we normally find from Disney. Truthfully, Groove usually has more in common with the old Looney Tunes shorts than it does the standard Disney fare. The flick offers none of the usual songs, and we get no romantic elements either; though Pacha is married to ChiCha (Wendie Malick) with two kids and another on the way, they’re simply depicted as a happy family, and Kuzco never encounters any possible love affairs along the way. Wackiness is the main emphasis, though of course some nice Disney heart comes along with the package; as nutty as the characters may be, they retain enough charm so that we care about them and hope for their success. Well, most of the characters, that is; I can’t say that we want Yzma to have a happy life. Still, Groove isn’t the kind of dark flick in which we find a villain whose demise we crave. Unlike something such as Snow White or Sleeping Beauty, Groove goes with a comic approach. Yzma most strongly resembles someone like Hook in Peter Pan or Cruella in 101 Dalmatians; we root against her but we still enjoy her presence and find her fun to watch. This factor is aided by a solid vocal performance by Kitt who makes Yzma cartoonishly nasty but exciting and catty. Actually, all of the voice talent was excellent in Groove. Spade offers the usual level of insolence and smarminess as Kuzco, but he still lets him become sympathetic and human when necessary, while Goodman grounds the piece as salt-of-the-earth Pacha. Warburton nearly steals the show with goony and delightful work as simple but earnest Kronk. Groove offers edgier fare than the usual Disney piece. 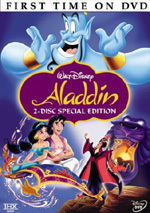 The original DVD’s box touts its similarities with 1992’s Aladdin, the huge hit generally regarded as the studio’s wackiest flick prior to Groove. However, that’s not really true. Aladdin’s humor came almost totally from the presence of Robin Williams; beyond his antics, it was still a pretty straightforward affair, though one that was very well made and delightful. While Groove benefits from its actors, it doesn’t rely so strongly on any one of them; it’s more of an ensemble, whereas Aladdin succeeded mostly due to the talents of one performer. In truth, Groove is probably more closely connected to Toy Story and Toy Story 2. Those are buddy flicks that work on the connection between a variety of characters, and they showed similar forms of edgier humor. Disney films aren’t known for their wild gags, which means that when we do find efforts with wackier comedic sides, they stand out, and Groove fits in well with some of the nuttier aspects of the Toy Story films. I don’t think The Emperor’s New Groove quite approaches the heights of those two terrific flicks, but it’s definitely a solid effort. The movie goes for a fairly raucous comedic approach and provides a terrific amount of wild and entertaining humor throughout its 78 minutes. It’s a well-executed and delightful film that I thoroughly enjoyed. The Emperor’s New Groove appears in an aspect ratio of approximately 1.66:1 on this Blu-ray Disc. Across the board, the image looked terrific. Sharpness appeared immaculate at all times. I never witnessed any hints of softness or haziness as the movie always seemed wonderfully crisp and detailed. No jagged edges or moiré effects appeared, and print flaws were absent as well; the film seemed clean and fresh. Groove featured a wild and vibrant spectrum of colors, and the disc reproduced them wonderfully well. Not many films offer this much variation in hues, but you’ll see a wide array of purples, reds, blues, greens, yellows, and pretty much everything else here. The colors always were solid and lacked any signs of noise, bleeding or other concerns. Black levels were deep and rich while shadow detail seemed appropriately dark but never excessively heavy. Ultimately, the disc presented a satisfying picture. Although the DTS-HD MA 5.1 sound track occasionally showed some surround usage, for the most part the audio stuck strongly to the forward spectrum. Across the front channels, the sound presented a nicely broad array due to a combination of stereo music and some strong ambient sounds. Effects weren’t quite as wild as I might have expected from this kind of frenetic film, but they seemed compelling and acceptably active throughout the movie; sounds popped up in the correct places and they panned well across speakers. Surrounds were also somewhat less active than I might have thought they’d be, but the rears added a nice kick to the mix and made it a fun and appropriately frantic affair. Audio quality appeared excellent. Dialogue always seemed crisp and natural with no signs of edginess or problems related to intelligibility. Effects were quite clean and realistic, and when appropriate, they showed some solid dynamics. Music could have provided a little more depth to its low end, but the score largely sounded clear and bright with acceptably appropriate bass. Although the soundtrack lacked a great deal of ambition, it still provided a good auditory complement to the wild visuals. How did the Blu-ray compare to the prior 2005 DVD? Audio seemed somewhat fuller and more dynamic, while visuals showed improved clarity and vivacity. The old DVD represented the movie well, but the Blu-ray bettered it with ease. The Blu-ray itself includes no extras, but we do get materials on the bonus DVD. 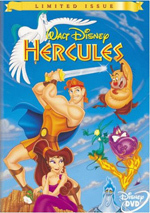 It literally duplicates the 2005 DVD, and we start with an audio commentary from producer Randy Fullmer, director Mark Dindal, art director Colin Stimpson, character designer Joseph C. Moshier, head of story Stephen Anderson, Kuzco supervising animator Nik Ranieri, and Pacha supervising animator Bruce W. Smith. For the most part, we hear from Fullmer and Dindal, both of whom were recorded together. At times, some snippets from what appears to have been a session with all of the men pop up in this edited piece. It’s an odd system, but it melds together well for a compelling track. Many animation commentaries tend to be dry and slow, but that’s not a problem here. Quite a few topics that related to the making of Groove crop up here, and we get a nice look at the process. Some remarks about the technical aspects appear, but we also learn a lot about the creative side of the equation. It’s those elements that often fail to appear in animation commentaries, so I really appreciated them here, and I enjoyed the discussions of pacing and tone that were vital to the film. Ultimately, I thought this was a very good commentary that added to my enjoyment of the movie. The audio commentary appears under the banner “Backstage Disney” along with some featurettes included in Behind the Scenes. “The Research Trip” shows a trek taken by the animators to Machu Pichu. In this 85-second program, we watch some aspects of this mission; it was a short but enjoyable look at the study done for the movie. “Character Voices” shows a five-minute and 12-second video in which the primary actors and their main animators talk about their work on the film. We also get to see some of the performers in action, so this was a fun piece. Finally, “Creating Computer-Generated Images” (originally called “CGI Props” on the original 2001 DVD) offers a two-minute and 20-second video in which 3D effects technical director Ian J. Coony demonstrates the process used to create computer-animated secondary elements; it’s a short but solid overview of those techniques. The Emperor’s Got Game is a quick puzzler notable mainly because it uses the voice talents of Eartha Kitt and Patrick Warburton. They reprise their film roles as Yzma and Kronk for this contest. Two mini-games appear. In the first, you need to correctly answer five trivia questions about the game, whereas during the second, you have to “pour” three vials of potion in the right sequence. It’s a short contest that has little replay value - the questions and answers are identical with each attempt - but it’s worth a look just because it’s fun to hear more from Kitt and Warburton. There’s also two music videos. First we get Rascal Flatts’ “Walk the Llama Llama”. During this 90-second piece, we watch the band lip-synch the song and also see some kids dance and film clips. At the bottom of the screen some dork demonstrates the dance for us. (I’m not trying to be cruel: this dude defines the word “dork”.) It’s a pretty fluffy little piece. The music video for Sting’s “My Funny Friend and Me” offers an unusual piece. It combines film clips, shots of Der Stingle as he records the tune, and interview bits into a two-minute and 54-second video. It ain’t much, but it’s worth a look. The Blu-ray disc opens with ads for The Little Mermaid, Monsters University, Iron Man and Hulk: Heroes United and SuperBuddies. Sneak Peeks throws in promos for Radio Disney, Disney Infinity, and The Many Adventures of Winnie the Pooh. The Emperor’s New Groove is a total joy to watch. It provides compelling characters, lively animation, and more laughs per minute than almost any other Disney animated flick. 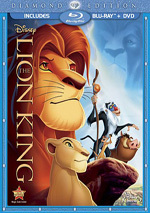 The Blu-ray offers excellent picture and audio along with some informative supplements. It’s too bad that many bonus materials from the original 2001 DVD remain unavailable, but the Blu-ray gives us such a good movie-based upgrade to merit my recommendation. Note that Emperor’s New Groove can be purchased only as part of a two-movie collection. 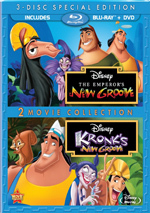 The Blu-ray also comes with the 2005 sequel Kronk’s New Groove as well as DVD copies of both films.